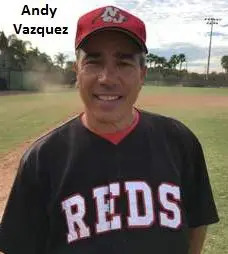 November 12, 2016, Clearwater, FL – Winning championships is no strange feeling for New Jersey Reds manager Andy Vazquez. So much so that the longtime MSBL manager has done it more than once. They have made the trip seven previous times and have come away with four rings. Saturday afternoon they added another feather to the cap, as the Reds used a big first inning to propel them to a 4-1 pitcher’s duel win over Long Island at the Carpenter Complex. Vasquez coached his team to another successful season in the weather-friendly confines of Florida and returns to New Jersey with more hardware to add to his already impressive collection of national championships. New Jersey got most of the runs they needed in the first inning, when they tagged three runs off of Long Island starting pitcher Rich Gosecki. From there, however, the Reds offense couldn’t kick itself into a higher gear and remained stagnant at the plate. The only other run New Jersey would end up mustering together was when Joe Rousso singled home Phil Forman and gave the Reds a commanding 4-0 advantage. Pitching dominated the day between the neighboring state clubs, as Gosecki and Boeckenstedt, who was named the tournament’s Most Valuable Player, both nearly went the distance in what both manager’s described as nothing other than a pitcher’s duel. In the top of the ninth for Long Island, D’Andria had the meat of his lineup coming up to the plate and the results started to show not too long afterwards. Long Island was able to load up the bases against Boeckenstedt and the team’s No. 4 hitter, Bill Steele came up to the plate. On the very first pitch, Steele hit a deep fly ball to left field and that would become the third out and end the game, giving the Reds the 50-and-over national championship.